My son was invited to my friend’s daughter’s beach themed 5th birthday party this weekend. They played some ball games in the yard, made a summer Beach Jar craft , ate some cake and had a lot of fun overall. 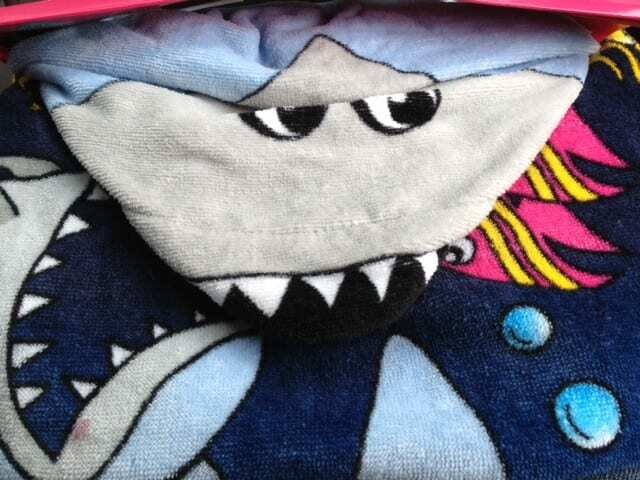 The “loot bag” was beach towels – different prints for boys and girls of course. As a parent I love when kids come home with practical and useful party favours like this. I know kids sometimes including mine prefer a loot bag to include a toy or candy but I just loved this. Turns out so did my son, he has been walking around the house dressed as a shark since yesterday. I know we will be using it all summer and for summers to come. I also love this Beach Jar craft for the summer. So easy , so fun and looks great. I remember making similar ones at the beach with coloured sand when I was younger. The sand was bought at Home Depot (and available at many such stores). The rest of the supplies were all found at either the Dollar store or Michael’s Craft Store. Fill about 1/3 – 1/2 jar with Sand. Add shells on the sand. Add Cocktail umbrella. Close jar. Decorate with stickers on the outside of jar. And that’s it. Enjoy! What a cute idea! I love the decorations on the jar! This would also be great as a mid-winter beach memento. 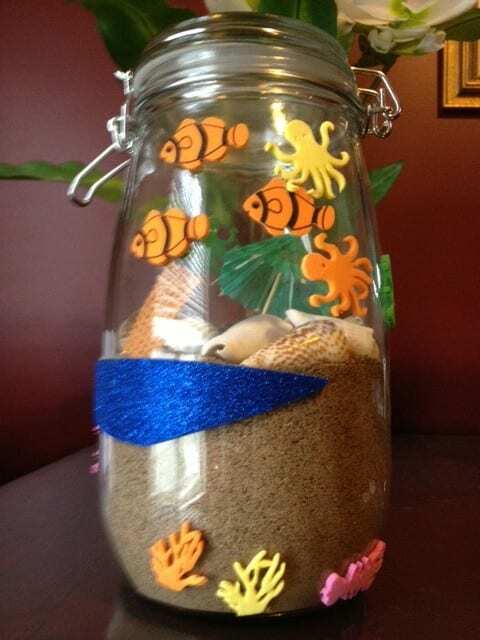 I love the beach jar – I want to make one with my kids! When I saw him come home with it I loved it too and had to ask my friend all about it. Tracy yes for a mid-winter memento too. I was thinking if we go on a beach vacation next winter- the kids usually collect shells etc. We will pick up some local stickers from the destination and make one – great idea for a souvenir too. Lots of fun – my kids tried this after a trip to Jamaica a few years ago with shells they collected. Living by so many beaches this is a really fun idea to do with my grandkids! Thanks for the inspiration! We have everything collected for our beach jars we are going to do them first snow days after the holidays !